A picturesque circuit off the Hume Highway from Mittagong. Rural and bushland scenery and all sealed roads. Galleries and cafes along the way. Can be used partly as a scenic alternative to the main Greater Blue Mountains Drive between Mittagong and Picton, which follows the Hume Highway. From Mittagong this discovery trail crosses the Hume Highway expressway then follows Wilson Drive through the villages of Colo Vale and Hill Top. Just past Hill Top, Wattle Ridge Road on the left leads into Nattai National Park and the beginning of Starlights Trail (experienced bushwalkers only). Wilson Drive continues on towards Thirlmere village, but before that, the discovery trail loops off to the left along W. E. Middleton Drive, through Thirlmere Lakes National Park and on to Thirlmere. Take some time to soak up the tranquil atmosphere of the lakes, have a picnic beside the reed-lined waters, watch the water-birds or go for a stroll. At Thirlmere, train buffs and just about anyone else will enjoy checking out the amazing collection of 60 locomotives and 100 carriages in the Rail Transport Heritage Centre. From Thirlmere, continue into the larger town of Picton with its charming historic buildings, cafes, hotels and galleries. 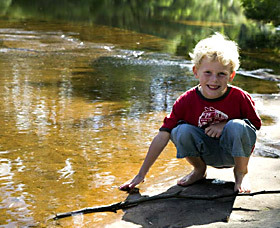 Here you can rejoin the main Greater Blue Mountains Drive and continue north, or drive back south along Remembrance Drive and across the Bargo River to Mittagong - a picturesque alternative to the Hume Highway.